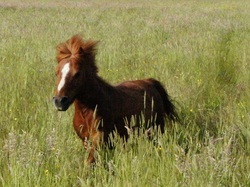 The Team is made up of six special miniature horses. Since I started The Mini Marvels Team some of the original team members have retired and little Hercules is now watching over us and there are some new members in the team. 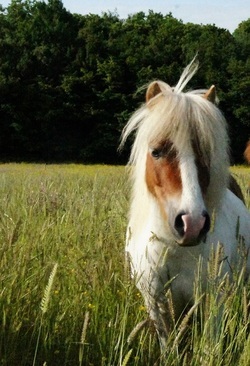 They all live at Maywood Stud in Kent with me and their other four legged friends, the M.M.’s might be small but they are not Shetland ponies, you will learn the difference on the Learning Curve page. Each one has a different character but they all love to work in front of an audience and strut their stuff! The Team are very famous and have a great following of all ages - wherever they go they make people smile. Silver Jubilee Event 'All The Queens Horses' in Windsor Park 2002! Came all the way from the U.S.A. Standing 32" high on a good day, with a light chestnut coat, a big bushy flaxen mane and tail, he was a handsome little powerhouse. He was my original MM and the leader! Hercules is now in horsey heaven so he has a special tribute page as he was the inspiration for the MM Team. stripy hooves. He i is very laid back and chilled out little fella, so relaxed you could imagine him on the sun lounger with feet up and glasses on! Was Hercules right hand man and his opposite leading the other half of the team when needed. He is only 30" tall but full of presence and the pretty boy of the team, he also does some modelling at times. and quite a show off. But he is having a problem with his Appaloosa status; his spots are going! However he is still a star in his silver coat. be on best behaviour at shows, all hair and little legs working, then suddenly he explodes bucking everywhere. 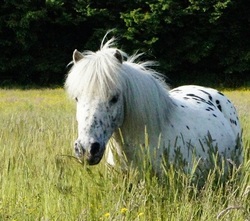 A real little spotty who made his debut in front of The Queen at the Jubilee Event 'All the Queens Horses'. He has stripy tiger feet and fancies being the Team Leader but the others remind him it's no good being frightened a steam engine whistle! Son of Hercules, the strongest and tallest Mini Marvel, at 34". He is the good looking solid dun with a flaxen mane and tail. He is the quiet member in the team who watches and listens. Sometimes at the shows he would be cheeky, stopping suddenly and eat the grass, while everyone else keeps going! The only lady in the team and the daughter of Goliath, she is also the granddaughter of Hercules! A little lady who know how to behave when the boys are being boys rolling in the mud getting dirty when they go out to play she will stand and watch! Cherokee is called Beau at home, he was another rescue case who came with him mother. he had a few problems with his hind legs so I have let him have a lot of time letting them strengthen naturally walking around the fields and the banks we have.